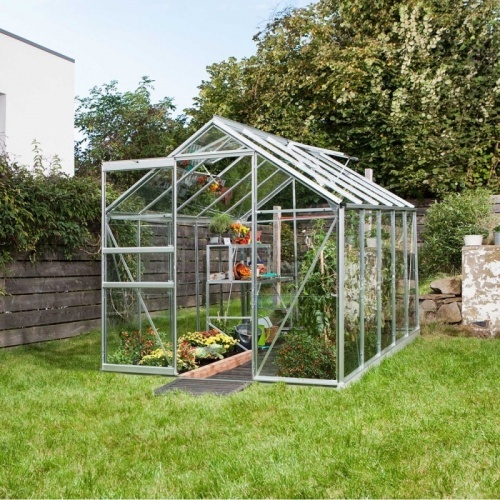 From novice to expert, the 1.93m (6’4”) wide Apollo greenhouse is available in 5 sizes to meet the needs of any gardener. The Apollo design is based on the Venus with the added benefit of a low threshold entrance for easy access. There is a single sliding door which can be positioned to the left or the right. The Apollo is equipped with 1 or 2 roof vents, depending on size and the structure has been strengthened with the inclusion of roof braces, with additional side braces in the Apollo 7500. The low threshold entrance distinguishes the Apollo from the Venus range. Not having to step over a perimeter base reduces any risk of tripping.